Los Angeles-based label Beyond Black & White is a fashion house conceived with the notion that style shouldn’t be sacrificed for comfort. Founder-designer, Derek Tucker embraced that philosophy and the idea that comfort should be luxurious. Tucker enveloped innovation and branched beyond the confines of the design room and shifted into the lab. He challenged himself to merge the exquisite value of cashmere with the comfort of cotton, Tucker then made the decision to blend what most consider a complex formula – mixing oil and water; he has since mastered the unique composition, a cotton and cashmere (jersey) blend. After years of development, Tucker built the Beyond Black & White brand with an emphasis on this exact science and created an original luxurious textile that he calls Luxmere™. Once the technical aspect of the fabrication was achieved, the next mission was to make a T-shirt that was both comfortable and fashionable. Tucker then slipped back in the Beyond Black & White design room and paired great, stylized wearable software, silhouettes made exclusively with his new distinct blend. Luxmere™ is the ultimate in technology, boasting a cotton-cashmere blend that feels like soft lofty cotton. It’s lightweight jersey T-shirts with quality construction keeps you cool in the summer and warm in the winter. Your favorite T-shirt now has cashmere; you won’t want to take it off, except to wear another style, by Beyond Black & White. The premium brand introduced the world, both men and women to life's embraceable luxury. The Beyond Black & White label features fashionable T-shirts crafted in the most luxurious of fabrics with a soft hand feel; an updated take on everyday essentials. “IT IS NOT A SWEATER” -- Luxmere™ is luxury designed with a live-in feel. Gain chic effortless style in Beyond Black & White jersey T's, and garner simplicity with a million dollar aesthetic. 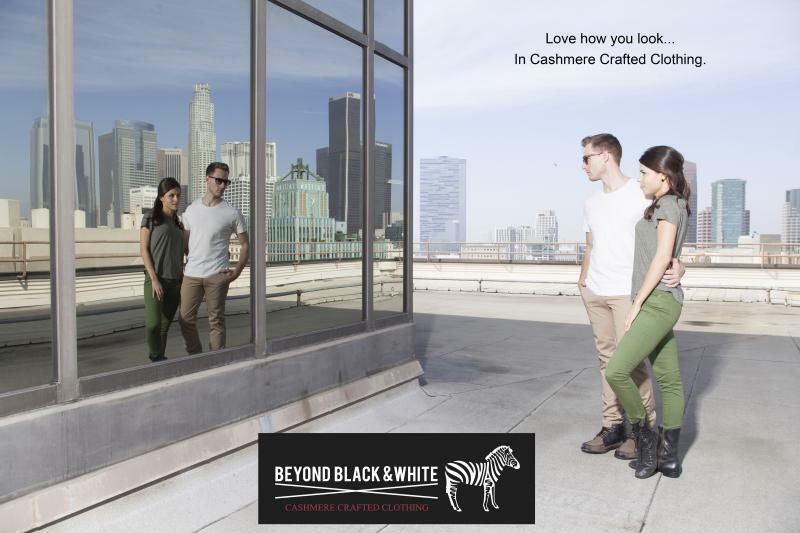 The Beyond Black & White approach to fashion and style will span across T-shirts, and will include men’s and women’s (twill) jeans, trousers, jeggings and beyond. 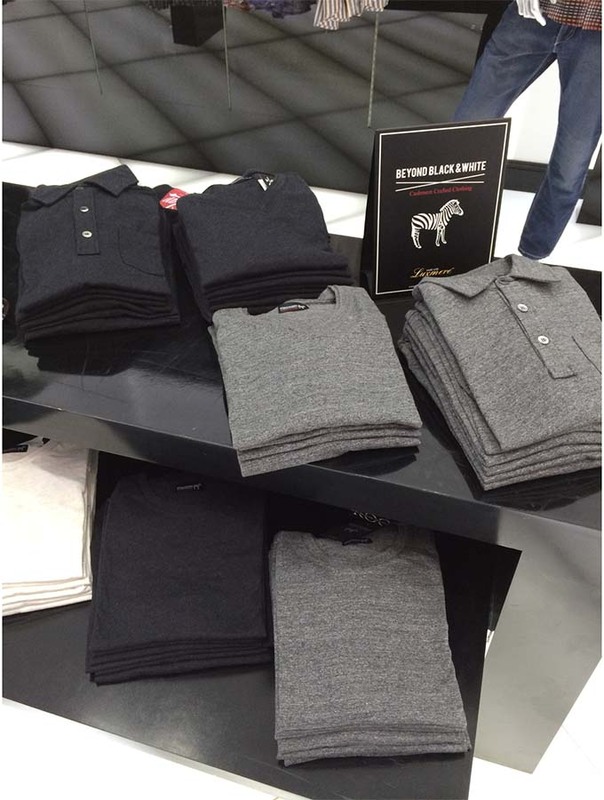 The company will also venture into pique polos, fleece, French Terry sweatshirts, sweatpants/joggers, shorts and double knit jackets and pants in addition to hats and footwear, all infused with Luxmere™ (cotton-cashmere blend) for a luxurious all over body experience. Luxmere™ is a unique cotton and cashmere textile blend. Irregularity texture is sometimes referred to as slub and is characteristic of Luxmere™ fabric. Little slubs are inherent to the cotton-cashmere formula and the complex dying process makes the color of each garment unique, and should not be considered defects in weaving. Luxmere™ is an elegant fabric with a lofty hand and an organic luster. 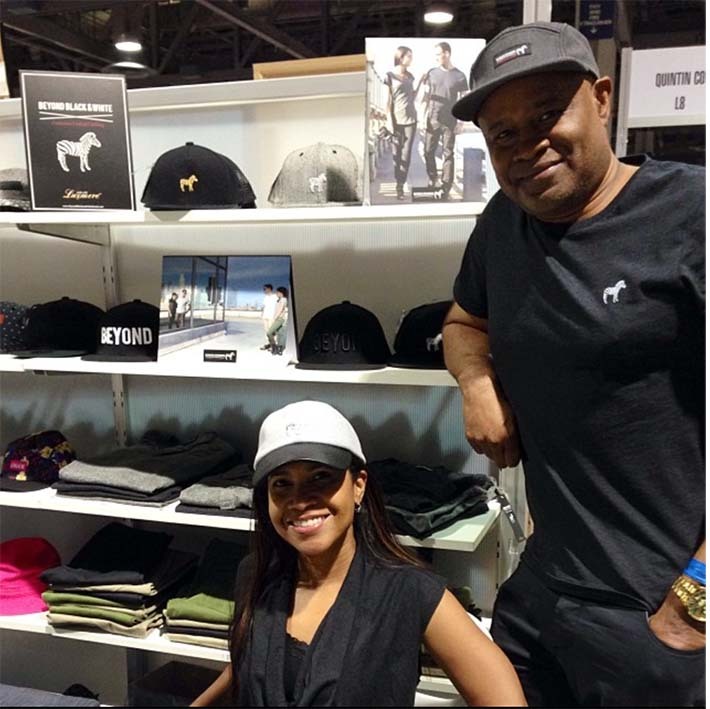 Max, Pictured with husband, Derek Tucker, an apparel industry pioneer, (﻿Forbes and Black Enterprise Magazines). Beyond Black & White collection, in retail store.